For more participants, please visit the home of SkyWatch Friday. What a beautiful colourful sky! Amazing colours! Very dramatic - love it! I have to tell you that my new tree has arrived from Holland now and tomorrow i´ll pick it up. I would love to tell the world that you inspired me to buy it - is it OK if I link to your blog? Sweet paint job! We do get some nice ones around here don't we? This is excellent! What a lovely combination of color and cloud formation. Fabulous sky. Very lovely colors. Great sky!! Those clouds are perfect, love the orange colors. Beautiful sky! Love the light on the undersides of those dark clouds! 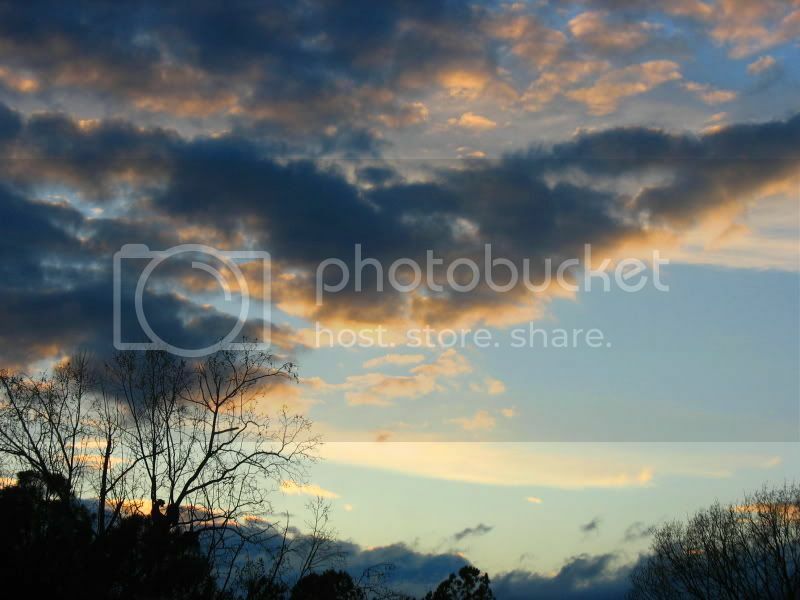 Dramatic SKY with really stunning colors and a perfect composition! So you are also welkome to my kitchen. Gorgeous shot, Carver! Such beautiful colors and the bare trees against the skies! Wonderful! Hope you have a very Happy Easter Weekend! We sky watchers have learned to be alert to the play of light from the setting sun on the clouds. Each evening is unique. Lovely colours captured just at the right time. Beautiful! This is what Easter week Skies look like inside my memories as a child. The perfect Spring day capture! Love the colours and composition. Beautiful sky. You were there right on time! What an incredible photo, what a gorgeous sky. Your world has a great big piece of my heart. Carver, how ever did you do that? People pay good money to get that same effect in the paint on their walls, and here it is in nature for free. A lovely, lovely sky Carver! I hope you and yours have a wonderful and blessed Easter! Fabulous sky! A sky not to be missed! Great photo and wonderful sky. what a dramatic but beautiful shot! love it! Have a good weekend Carver!! A beautiful photo, the clouds and sky look wonderful. Your sky picture today is absolutely stunning. In a way the darker clouds look like a big bird with outstretched wings. Great job. Beautiful! Mother Nature does a wonderful job.